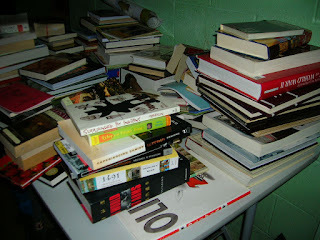 Some of the books waiting for my husband to put them away. I would do it, but he has a "system". Also, we are out of bookcase space. These are some cup snuggies I made for my MIL last weekend. We were visiting, and it hit me that she was running out of snuggies since she was resorting to using beer cozies. 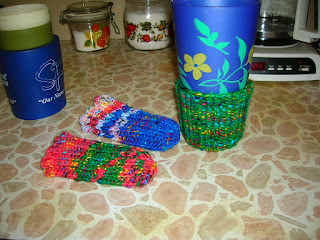 They were quick and fun to make with yarn leftover from the baby hats. She likes them. Pattern, you ask? Umm - cast on about 40 stitches (worsted weight, size 8 dpns), k2p2 ribbing for about 4 inches or so, then decrease quickly by knitting 2 together all around until you're down to just a few stitches and you can thread the yarn through and pull tight, weaving in the end. Presto, zippo, it's done! This is Sunshine. 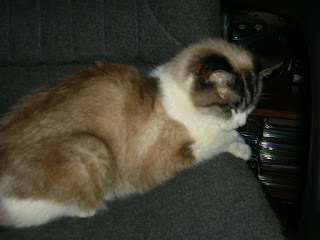 She is a dear old cat that lives with my MIL and FIL. She joined them after being abandoned by someone else in the neighborhood. She is one of the sweetest, snuggliest cats I've ever known. Her sweetness is largely why I finally decided I could no longer live without cats. 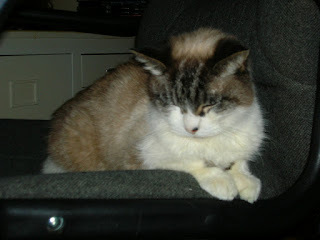 I had to take some pics of her because she is so old and frail, I'm afraid she won't be with us much longer. One of her housemates, Ugher, is also very old and frail, but she's still so darn grouchy I didn't want to bother the old dear with the flash.